It came at a conspicuous time; on June 3, 2010 a Marcellus gas well blew out in Clearfield County, PA – less than two months after the BP Oil Spill in the Gulf (and before that spill was capped). Luckily, the Clearfield blowout did not kill or injure workers or spill five million gallons into the ocean, but it does raise significant public health preparedness and environmental health questions. 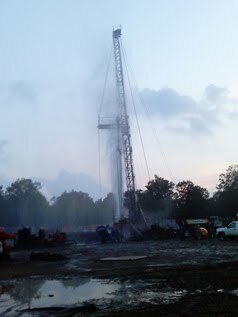 The Pennsylvania Department of Environmental Protection (PA DEP) released a report stating that untrained EOG Resources personnel and improper control of the well were the cause of the blowout that released wastewater and methane gas into the atmosphere for 16 hours. EOG also failed to notify the DEP about the incident until several hours after it began. The Clearfield well site in question is located in the center of PA off of I-80 (see map below). Not including the danger to workers from the initial blowout, what if the gas being released had ignited? What if the site had not been in the State Game Lands and been in a more populated or possibly urban area like Lawrenceville, a neighborhood in the city of Pittsburgh? What if an explosion had occurred that caused the wastewater and gas to be released for much longer? How can emergency responders be better prepared to handle issues of this magnitude? How can communication channels be improved to reduce the amount of time between incident and proper response? On the part of emergency responders, some progress is being made. CHEC continues to receive reports that more and more local first responders, including volunteer firefighters, are being trained in PA and WV to deal with potential accidents and blowouts on well sites. Additionally, the PA DEP has hired a team of responders throughout the state who are no more than five hours away from any drill pad. >Thanks Anonymous for checking in. You're right and I have removed the incorrect term originally included in the post. >Please check terminology. This was a blowout, not an explosion. The gas could have ignited, which would have triggered an explosion, but it didn't. >The above link is not working, i.e. it's missing a .htm at the end.